I'm sad to say that last week-end we used up the final bits of the lamb I bought just before Christmas. Where did it all go? But Lundulph was coming to Sweden, so I thought we could make something rather festive. The bit that was left was the saddle and it didn't look like it would be enough for 5 people, so my Mum also dug out a steak of some sort. I decided to make an old but very tasty recipe. But being part of Ye Olde Recipe Collection, it had some very shop-specific ingredients, that I was not able to get hold of. Like Chinese Five Spice Paste. So I researched it on the internet a bit and found out the ingredients. Based on that, I looked around for recipes for the paste and found many useful suggestions. Basically start with Chinese Five Spice dry mixture and mix with some wet ingredients into a paste. I managed to get hold of a jar ready mixed at the English Shop in Stockholm. Yes, there really is such a thing! Carefully mix all the ingredients the night before the paste is needed. Cover and keep refrigerated. The above makes about 1 dl. Then just follow the recipe. This way you can be a bit more generous when coating the lamb too. Well, you can imagine my surprise and joy when I found out that one of the supermarkets has started selling ready made sourdough. Not just that, it also claimed to be ready to use. Interesting! So at the first opportunity I went to get some - they had two types, wheat sourdough and rye sourdough. Since I'd not worked with rye sourdough before, and it's been a while with the wheat one too, I opted to try the wheat first. Reading the instructions on the lid, it said "add yeast". Well, what's the point in using sourdough then, eh?!? But thinking things through, it occurred to me that the sourdough was just for flavouring. Would this mean that it wouldn't be alive? The best before date was several weeks in the future, that's a bit suspicious, even if sourdough can survive a long time, how would it be "ready to use" at any point in time up until that date? So, I went for what I've done in the past with Monty - I fed it. As I opened it, it was runny like Bulgarian boza. It also smelt rather weird. Oh well, in with water, in with flour. I didn't measure very thoroughly either, but just tried to obtain a very thick batter consistency. Then in the oven it went, the oven was still a little warm after a previous bake. And off I went shopping. I came back several hours later and noticed that there had been a rise to the double in the jar, but it had sank back to the original amount. Maybe here I made my mistake - I fed it again. This time it smelt a bit more like Monty used to do, and it was bubbly, so I thought everything was fine and let it stand for a further few hours. Sadly, there was no further rise at all after the second feed. I had thickened it further, to reach the regular consistency of Monty. So there was plenty of food for the wild yeasts. It still bubbled, but didn't rise. But I had lost patience and made the dough anyway, and let it rise in the oven again, though this time I set the oven to 30 degrees C to help it out. This seemed to do a trick, because the dough did rise nicely. I took it out and shaped it into 3 small loaves and left it to proof overnight in cool room temperature, about 18 degrees C.
The next morning, I looked at it and it hadn't moved a bit. Dang! Well, never mind, into the oven it'll go. So I baked it and it did make a heroic attempt at oven spring, but in the end my loaves remained the same size as when they were raw. And when I cut it, I had the texture of marzipan. 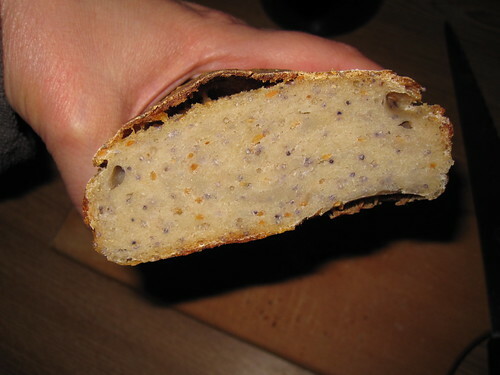 Flavour-wise, it was very good, I'd mixed in sesame and poppy seeds, but this wasn't bread and I had 3 brick-like loaves of it. Bah! On the plus side, heated up a bit in the microwave and dipped in kyopoolu was totally fab. I won't be doing anything with the rye sourdough, I'm leaving it to my Mum to play with. The reason for this is that I'm moving back to the UK and my lovely hubby Lundulph at the beginning of April. Quite looking forward to that and getting on with more cooking and baking. I have so many new ideas that I've noted down on various bits of paper, hopefully I won't lose any of them. At my Glögg Party last year, Dr Cutie gave me a book on macarons. Not only did it have lovely photos of those fab sweets, it also had some very useful advice on how to succeed. For starters, it recommends that the ground almonds and icing sugar are mixed together and run in a blender in order to get it as finely ground as possible. Another useful tip is to fold in the dry mixture in three parts, I think this allows for a bit more control over the whole thing. It also said that after the last part has been incorporated, the meringue mixture will likely be quite stiff, so one should just continue to fold until it loosens up a little and is ready when the mixture runs down in a thick ribbon from the spatula into the bowl, where it will stay in shape for about half a minute or so. The most crucial piece of advice is that once the macarons have been piped and banged/dropped to flatten, they must be rested for about 30 minutes. I had this instruction in my patisserie master class, but I failed to realise why this part is so important and I haven't come across this explained elsewhere. The reason is that during this rest, the macaron surface will start drying out and form a skin. 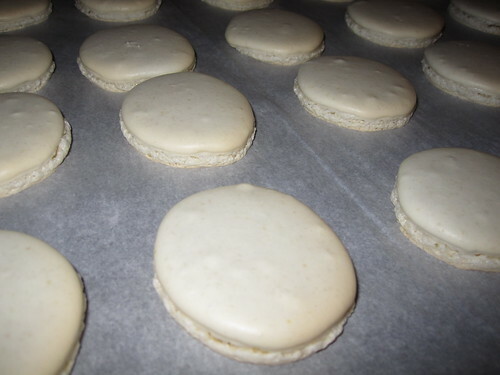 Once it can be touched without sticking to the finger, the macarons can go in the oven. This will help form the crunchy surface and force any steam trying to escape to go out through the edges and thus form the curly bit on the sides. And of course the recommendation of doing a few batches to understand how one's oven works and find the right temperature and baking time. I guess I also have gained some experience in working with meringue to have a better feel for the whole thing too. 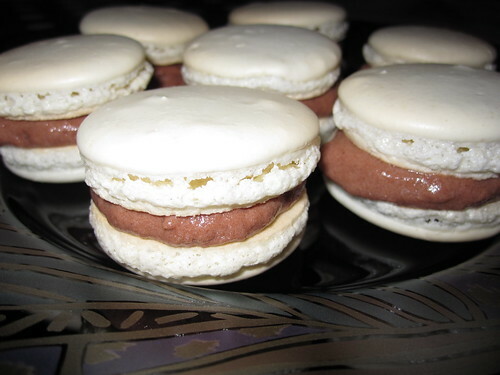 So yesterday, Bip and I made the first recipe in the book - classic vanilla macarons. Put the almonds and icing sugar in a blender and process for no more than half a minute. Sift the mixture into a bowl. Return any large pieces to the blender and blend again and sift. In a large glass or metal bowl, whisk the egg whites to soft peaks. Then while whisking slowly add the caster sugar until stiff peaks and a glossy meringue forms. Add the vanilla extract at the very end, whisking just enough so it is mixed in. I demonstrated to Bip that you're supposed to turn the bowl upside-down over your head as a test. Now carefully add one third of the dry mixture and use a spatula to fold into the meringue. Once fully incorporated, add the second third etc. Once all dry mixture is fully mixed in and the meringue is just a little runny, prepare a piping bag with a round nozzle and transfer the meringue into it. Line two baking sheets with clean baking paper and pipe small blobs onto them. They should spread out on their own. Once all the mixture has been piped, either pick up the whole baking sheet some 5 cm over the worktop and drop it down or bang the baking sheet with the palm of your hand, so that trapped air bubbles come up to the surface of the macarons. Pop these gently with a needle, so they don't bake into the macarons later. Now leave the macarons to stand for about 30 minutes so that they form a skin. It should be possible to touch them without getting meringue mixture onto your fingers. Pre-heat the oven to 150 degrees (or 130 degrees if fan assisted), then bake one sheet at a time for 10 - 15 minutes (fan assisted will be around 10 minutes). Take out of the oven and leave to cool for 10 minutes, then carefully remove to a wire rack to cool completely. If the top and bottom separate, the macarons can go into the oven for a couple of more minutes. The recipe recommended to use a vanilla flavoured butter cream, but Bip and I opted for chocolate mousse of the Angel Delight type. I was so happy when the macarons turned out like they were supposed to! Although next time I won't use the large piping tip, it was too big and my macarons ended up just a little too large to be eaten in one bite and with the filling so soft, they were hard to eat. A smaller tip will allow more control. I also need to take more care when sifting the ground almonds, it was still not sufficiently fine and I had a few lumps here and there. I did use the blender to grind whole blanched almonds. The problem is that if you run the blender for too long, the almond fat melts and forms a paste rather than flour like substance. Next time I'll try using the coffee grinder, that might give better results. But I feel very proud to have sussed the trick, leaving only a couple of minor adjustments to do in order to get things perfect. There are 29 more recipes in the book and the quantities are all based on 2 egg whites, which result in about 20 complete macarons. Yesterday my Mum casually mentioned that there are loads of avocados in the house that needed to be eaten fairly urgently, so I suggested we make guacamole. I've never done this before and have wanted to try my hand at it. My friend Boncey has quite a knack for it, so I have a very high watermark to hit. What I have noticed is that avocados sold in Sweden are tiny in comparison to the ones you get in the UK. I'm not sure why, but such is the case, at least at the shops which I've been to. So I decided that two Swedish avocados would count as one. This means I had 4 big avocados to use up (or 8 tiny ones). A quick google on the food pages of the BBC gave several interesting results. The one I settled on is from The Hairy Bikers. They have proven reliable to me in the past and I do quite like them. And once again, I was not able to follow a new recipe to the dot, so here is my take on it. The original recipe can be found here. 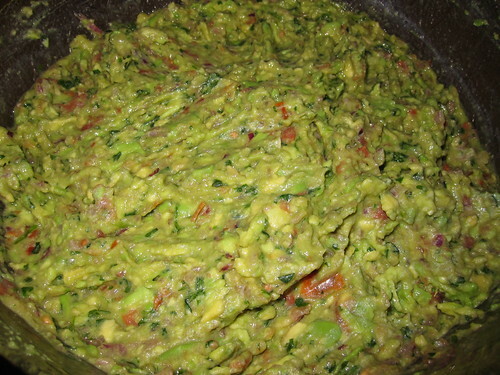 Place everything except the avocados in a blender and process until a pulp, though not entirely smooth. 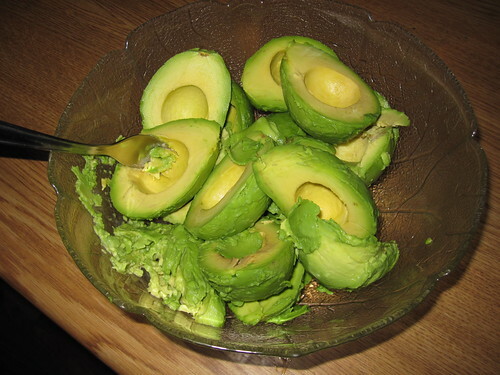 In a serving bowl, scoop out the avocados and mash with a fork. Pour in the tomato mixture and stir in to combine. It is now ready to serve. The amount of salt depends on what the guacamole will be used for - we were going to have a "myskväll", which means a cosy evening, mostly in front of the TV. And my Mum had bought tortilla chips to dip. Thus I didn't put much salt in it. We ended up with a really large bowl. As it turned out, there was no need to worry that we wouldn't be able to eat it - we managed to put away about two-thirds of it straight away. We being me, Mum and my Sister. In fact, Bip was well impressed with how tasty it is - she does guacamole, but generally uses spice mixes which she stirs into the mashed avocado and that is of course a bit different to what we did yesterday. Although I did not get anywhere near Boncey's wonderful guacamole, this is definitely a repeat recipe, and I'll try to use fresh chillies next time. Mum thought it had too much coriander, though I thought it was OK. 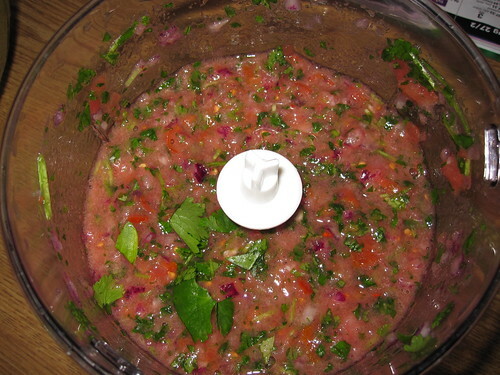 But I will reduce the amount of tomatoes, they were too prominant for me.